← A Most Unusual Firing. My Greatest Hits, Part 1. This picture was taken 40 years ago, the very month that I started my career as a professional potter. 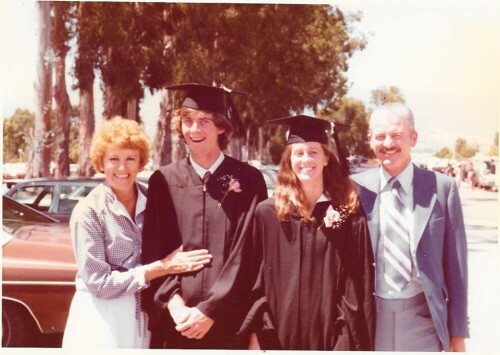 I had already plunked down first and last month’s rent for studio space at Santa Barbara Ceramic Design and was working part time in the freshman orientation program at UCSB, a job that was slated to end in September. Making pottery for a living was my “run away and join the circus” plan for avoiding getting a real job. It was actually a pretty good idea because I had just gotten a degree in art history and the economy in 1978 was absolutely horrible. It was the era of gasoline shortages and high interest rates, not a great time to start a pottery manufacturing business. I was really lucky to be able to spend all that time during those early years learning the skills that have carried through my career as a potter. 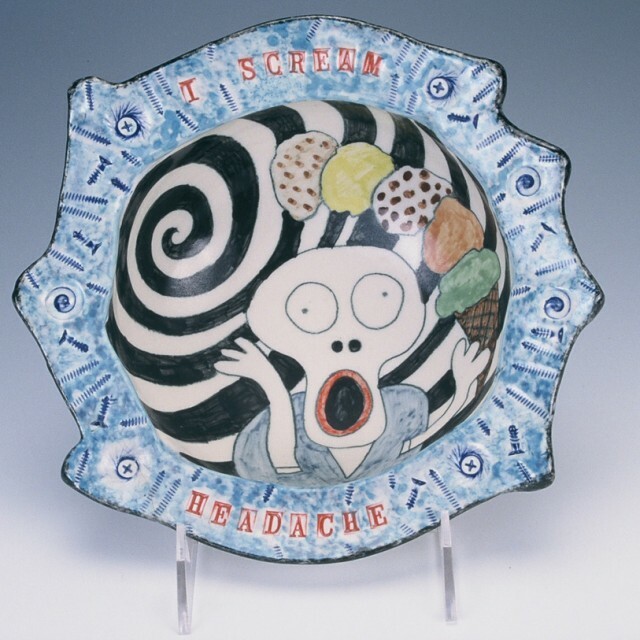 So in the spirit of nostalgia, I’m going to show you some of my favorite pots that I’ve made over the past four decades. Many of these items are still part of my line and for sale in my online store. I present them here in random order, because to do a ranked “top twenty” for art would be a difficult process. This is one of the most enduring designs I’ve ever come up with. 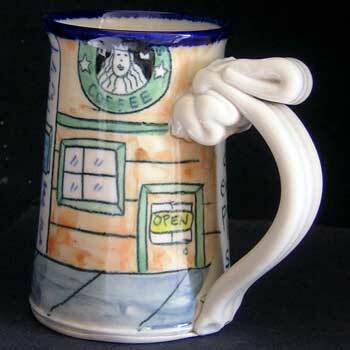 I made the first one back in 1985, and when it came out of the kiln I knew I had a big hit on my hands (pun intended). It’s a consistent best seller, and is the epitome of the goofy jokester persona that my work emulates. 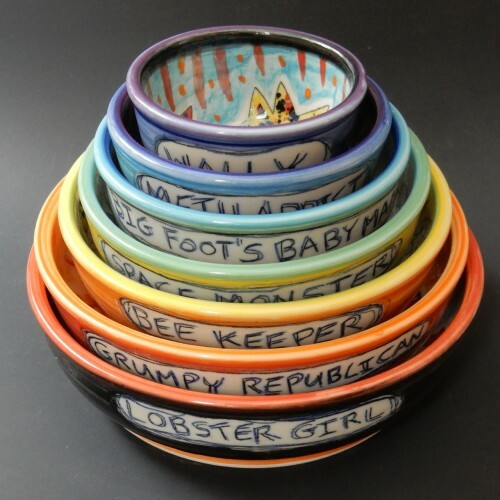 You can find it in the funny bowls section of my online store. Well, yeah! Of course “Electric cars are good for the environment because electricity comes from magic” is gonna be on this list. This mug has a really solid joke and cartoon to begin with, but the fact that one of the most interesting people on the planet tweeted and then “borrowed” the image makes it a crown jewel of my oeuvre. 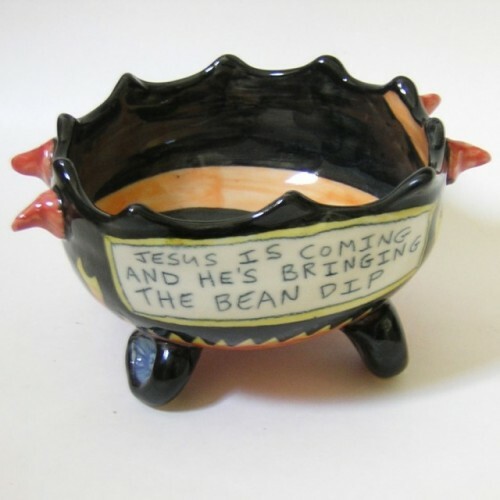 And now there’s an entires section of my online store with farting unicorn pots! 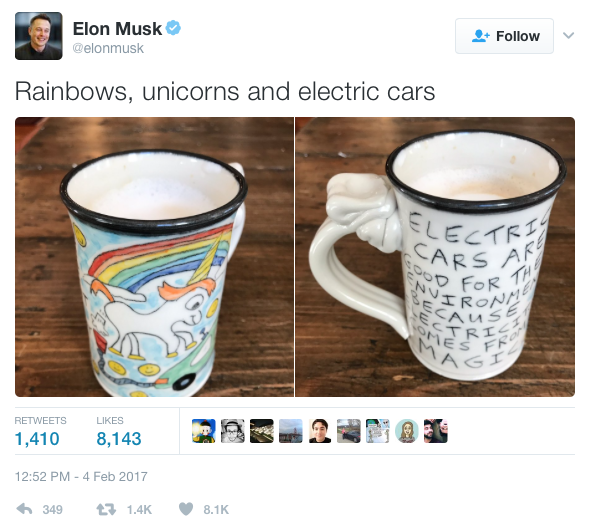 BREAKING NEWS: On Tuesday, June 24th Westword published the story, “Elon Musk is a farting unicorn fan, but blew off creator Tom Edwards”. Check it out! Back in November of 2015, I watched a great little British reality TV show called “The Great Pottery Throw Down” and it inspired me to make this bowl set. Here’s the blog about the creation of these pots. This image now graces my business cards! 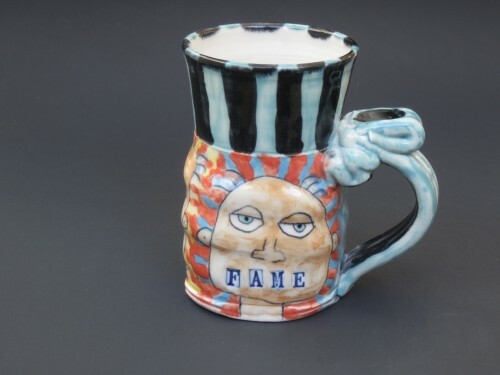 What inspired me to make a series of over sixty original art mugs inspired by David Bowie and Iggy Pop lyrics?!!! I don’t remember, but the this series from 2013 remains one of my favorite art endeavors ever. They are all off in private collections now, so if you are a folk are historian from the future looking for them, good luck! 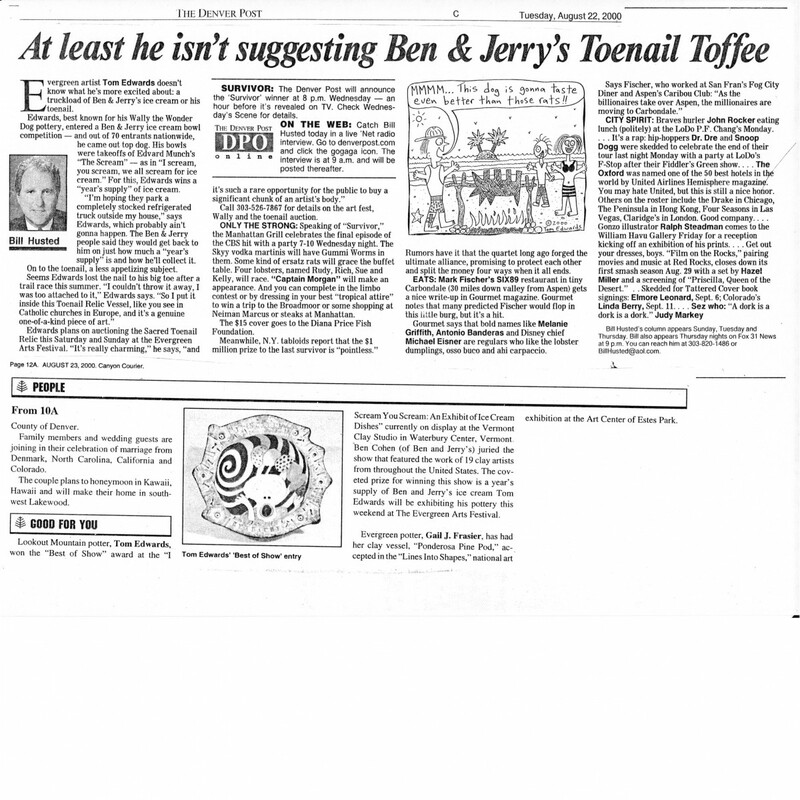 And speaking of “Fame”, this little gem got me some nice media attention way back in August of 2000 when I won a year’s supply of Ben and Jerry’s Ice Cream with it! My daughters were eleven and nine years old at the time and it’s now a treasured family memory. Robin and I reminisced it in a Fathers’ Day interview for Westword four years ago. So sweet! Wally fans, don’t despair! Your favorite cartoon dog is making the list right now with this classic design that, for me, epitomizes the perfect hot selling coffee mug. I’ve always said that any coffee mug with a joke about coffee will sell well, but this one is truly genius. 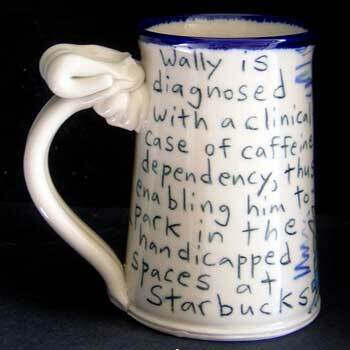 And I’ve got them in stock right now in the Wally Mugs section of my online store. 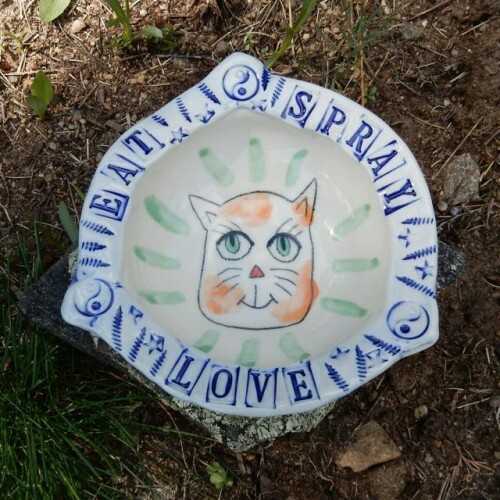 Similarly, I think this is just about the best cat bowl in the world because the joke is so odd and spot on for describing the feline psyche. These really never sold that well (WHY?!!!) but I like this concept a lot. They are still part of my line, but maybe not forever. You can find them in the cat bowls section of my online store. 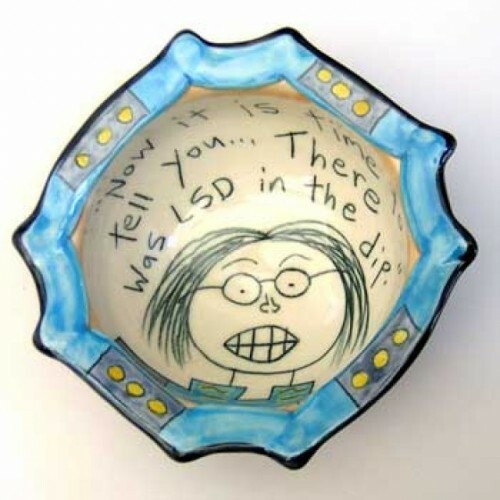 Here’s the first pot I ever made with a cartoon on it! 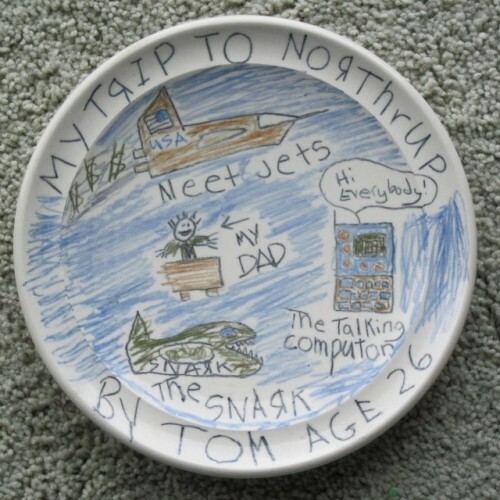 It was a Fathers’ Day gift for my dad way back in 1982 after we did a family field trip to Northrop, where my dad was in charge of developing the software system for the MX Missile. Ahhhh…. it’s the plate that launched my entire focus for decades to come. You can read more about it in the “About the Artist” section of this site. Thanks, Dad!!!! And last but not least for this first half of the trip down memory lane, I present the most labor intensive bowl in my line! You can buy them here and you can see an entire photo essay on how they are made here. A couple of weeks from now, I’ll post the second half of this list. Stay tuned! This entry was posted in Art Pots, Bowie-Pop mug series, Elon Musk, Uncategorized. Bookmark the permalink.